Today Colonel Mustard and I went to The Stand. Actually, Colonel Mustard suggested The Stand, and I grudgingly obliged, since this iteration of The Stand was/is in a glorified food court in Century City in the middle of a bunch of office buildings. In other words, the forecast called for disappointment on a mealy bun. That forecast was dead wrong, and I am deeply ashamed for having doubted Colonel Mustard--he is a fine human being and a ruggedly handsome man. 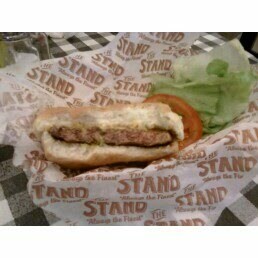 The Stand burger was about 10 bucks with a side and a drink. The beef was a nicely aged, preformed, 1/3 pound patty, which got a nice set of grill marks. In spite of the grilling, the lean patty came out Medium without being dry---WIN. The bun was moist and yeasty, and that yeastiness provided a perfect end note to counterbalance the aged beef funk that I started the bite with. There were numerous cheese choices--I would suggest that the American cheese was the best bet here, because the cheeseburger was little under-seasoned, and the American cheese added the perfect amount of salt that made the beef really sing. You can go with Cheddar and season to taste, but you also risk screwing up the entire dish with too much salt. The burger to bun ratio--just right. The picture does not do the burger justice. This was by no stretch the best burger we've ever tried, but it was perfectly fine, and within walking distance from TheBurgerBusters lavishly appointed penthouse suite, which occupies an astonishing amount of space yet retains a modesty and reserved intimacy that one might not expect. Word. Burger Review : Yes, have some. The surroundings created lowered expectations, which The Stand easily exceeded.